The Trappers’ Festival, held in The Pas in the midst of winter, is an event of interest and enjoyment for many people. The intent of the Festival is to celebrate the heritage and culture of the northern pioneer, and to preserve many of the skills and entertainments inherent to them by basing the celebrations and competitions on those activities. All the planning and organizing is geared to generating a sincere and friendly atmosphere of Northern hospitality. The events and activities of the Trappers’ Festival have continued since 1916, making this Manitoba’s oldest festival and one of Canada’s oldest winter festivals. Many festivals have used the theme and organizational structure of the Trappers’ Festival, and have looked to the managers and organizers of this event for information and assistance. Edwin Lambert, winner of the 1949 World Championship Dog Race. In 1915, a group of old timers, among them C. B. Morgan, William Bunting and William Hughes, met in the Opasquia Hotel on Edwards Avenue to discuss the problems encountered in the community during the Fur Exchange, and to discuss the possibility of organizing and staging a series of events around a competitive dog race. Trappers, prospectors and fur traders utilized dog teams as their major means of transportation. 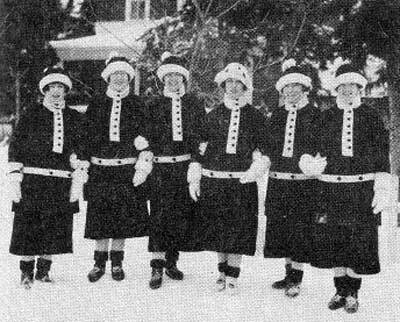 Because these pioneers gathered in The Pas during the winter to acquire provisions, supplies, and to trade, it was decided to organize the festivities that generally occurred into an orderly festival. The purposes were to motivate the development of a better type of sled dog, and to publicize the opportunities and development in The Pas and in Northern Manitoba. Originated in 1916 under the name The Pas Dog Derby, the festival continued until 1931 (except for the war years of 1917 and 1918) when economic conditions forced its suspension. 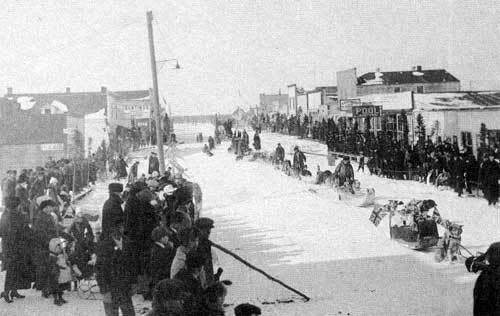 The festival was commonly known as the Trappers’ Festival, but had formal names of The Hudson Bay Dog Derby, The Pas Winter Festival, and the Northern Festival. During the years from 1916-1931, the dog race took place over a distance of between 140 and 200 miles. The rest periods and feeding times were left to the discretion of the musher. The race was usually from one town to another, and included Carrot River, Cranberry Portage, Flin Flon, and Cumberland House. The festival and World Championship Dog Race were revived in 1948 and have carried on without interruption since. Until 1976, the dog race was run in three daily laps of 50 miles each. The team with the best overall time was awarded a cash prize, and until 1960 received the Hudson Bay Mining and Smelting Silver Rose Bowl. The winner of each daily lap also received a cash award. In 1960, the Labatt Trophy, a beautifully engraved bronze plaque designed by noted wildlife artist Clarence Tillenius, replace the HBM&S rose bowl. This has been presented since that time to the musher who completes the three days with the best time. Prizes are also presented down to tenth place with a cash award going to all the mushers who start the third lap. In 1976, the race was shortened to 105 miles and continues to be run in three laps timed on a daily basis for an overall best time. The Kinsmen Club of The Pas have administered this all-important facet of the Trappers’ Festival since 1963. The race usually begins with a mass start on the Saskatchewan River at 10:00 AM and runs Thursday, Friday, and Saturday of the festival on a course that parallels the Carrot River on PTH 283. An alternate starting point is arranged in inclement weather conditions, but the race follows the same course. This festival has the unique opportunity for spectators to follow the race visually from start to finish. Because of the stamina and skill required by the mushers and dogs, they must train for long periods prior to the race, and they come internationally to enter this most prestigious event. 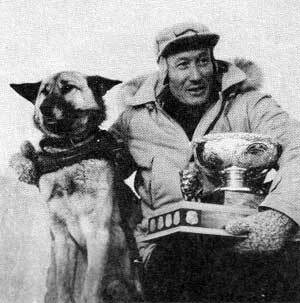 Past winners of the World Championship Dog Race have come from The Pas in particular, but also from relatively nearby communities such as Cumberland House and distant areas such as Yellowknife and Swisher, Iowa. The individuals who revived the dog race in the late 1940s were Henry Fishman and Wilf Walkinshaw, local merchants. They came up with the idea of organizing a proposal for the incorporation of the whole North into the revival of the festival. All the Northern communities were invited to participate. The festival was to be held in conjunction with the Fur Advisory Council Convention held in The Pas in January. At the time, fur was in large supply and held a high price, a situation not normal for most commodities. The Fur Convention was held in The Pas due to its central location in the North. Communities involved with the first Northern Manitoba Trappers’ Festival (as it was termed) were Flin Flon, Cranberry Portage, Sherridon, Churchill and The Pas. Each community was responsible for organizing the activities and events of a given day. First parade, The Pas dog derby, 1916. This trend has been repeated annually. As the fur industry took new directions, the Fur Advisory Conventions were discontinued. But the Trappers’ Festival has remained with only a change in date to the third weekend of February with the hope of slightly milder weather. Another major change has been that when other communities started holding their own festivals, they discontinued their complete participation in the Northern Manitoba Trappers’ Festival. However, there still exists an ongoing sharing of ideas and experiences among all the Northern Festivals. During the many years of the Trappers’ Festival, the competition in the Fur Queen Contest has been extremely keen, exciting and rewarding for scores of beautiful, resourceful, and intelligent girls. Since 1916 these young ladies have been judged on talent, poise and personality. They receive many lovely gifts courtesy of local merchants and corporate sponsors. Currently the contestants and their sponsoring organization must sell a quota of tickets in order to qualify for the contest. The proceeds from these sales provide some of the capital and financial backing for the Trappers’ Festival; the event also receives generous support from corporate sponsors such as Labatts, Canadian Airlines International, Corby Wiser, Schenley, the Town of The Pas, and Manfor. The taxpayer carries no burden for grants distributed to this festival, which has and will continue to be self-sufficient with the support of the volunteers and sponsors in the community. The King Trapper Contest was inaugurated in 1955. Up to that time there had always been a Queen, so why not a King of the Trappers? The title is awarded to the fellow securing the most total points in all the various contests and sporting events. These events have hardy Northerners vying one against the other in contests which are indicative of the art and skill required by the early inhabitants to gain their livelihood and, in some cases, their very survival. Contests such as tree felling, wood cutting, wood splitting, canoe packing, flour packing, trap setting, muskrat skinning, tea boiling, bannock baking, moose calling, goose calling, and so on, each contribute cash prizes to the winners as well as points which add up to the total which might win the coveted King Trapper trophy and title. Perhaps one of the most popular contests is the flour packing, reminiscent of the early days when all the freight was hauled throughout the North by canoes and York Boats and packed over portages between lakes and other waterways. The record to date for flour packing is 1000 pounds carried by John Flett in 1972. Women as well as men participate in this contest. Also high in popularity are the tea boiling and bannock baking contests. In the tea boiling, the contestants line up, race to their individual piles of wood, split kindling, start their fires, melt snow in their tea pail to make it about half full of water and, when it comes to a boil, add the tea leaves. Speed is the main requisite of this contest, but the tea must be of good quality. In the case of a timed tie, the quality of the tea wins. Bannock baking takes a little longer, using the same fire because the coals are readily available. Each contestant is given an amount of flour, baking powder, lard, and salt. These are mixed and it is up to the individual to choose the manner in which it is cooked. Usually it is formed around the end of a stick and toasted over the coals. These contests take place out of doors often in -20°F to -30°F weather. The all time record for tea boiling is four minutes. Muskrat skinning is another interesting contest. The entrants are judged on the quality of the workmanship, the condition of the pelt, and time transpired. The remainder of the contests are judged on time and ability. The Northern Manitoba Trappers’ Festival, Inc., extends a cordial invitation for one and all to attend their annual celebration from Wednesday through Sunday of the third weekend in February. With thanks to Sid Wilton.